With nearly 1,300 units in its transportation fleet, there are many things to consider when the Omaha Public Power District prepares equipment and vehicles for duty. Rain, snow, or shine, bucket trucks, digger derricks and utility trailers must all be ready to go to work when needed. Keeping this equipment ready is a job that falls to OPPD’s Transportation Department. In the winter, frigid temperatures and equipment exposed to the elements pose particular challenges. Winterizing the fleet begins with preventative and regular maintenance throughout the year, said Mike Donahue, manager of Transportation & Construction Equipment for OPPD. 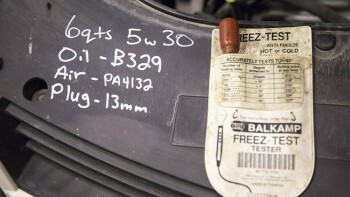 The maintenance done to the equipment is similar to what you might do for your personal vehicle: checking coolant levels, tires and brakes on a regular basis. Donahue said the challenges of winter come with vehicles who run on diesel fuel. These vehicles are outfitted with block heaters to keep the engines warm when subjected to frigid conditions. Many of OPPD’s vehicles park on job sites for periods of time, meaning the drivers and equipment operators do their part to ensure the equipment is in optimum working order, including adding fuel additives and heating engines when needed. “It’s good to have personnel looking at these things because we as a department can’t go to every job site and check on equipment,” Donahue said. The service schedule for vehicles depends on their usage time, Donahue said. For example, trailers are serviced yearly while bucket trucks used daily by troubleshooters are serviced once per month. Other trucks in the fleet are serviced every other month or every two months. Service frequency depends on the number of miles put on the vehicle and how many hours it’s been in service. Outside the Transportation Department at OPPD’s Elkhorn Service Center, one of four garages that service the utility’s fleet. Mark Donham, field supervisor for Transportation & Construction Equipment, said equipment in OPPD’s south rural territory are serviced more frequently due to the higher number of miles they drive to cover the service area. Many times, transportation personnel will go into the field to make a repair. Donahue said if a repair can be done in the field, the parts can be transported there and the repair can be done safely, personnel fix it in place. 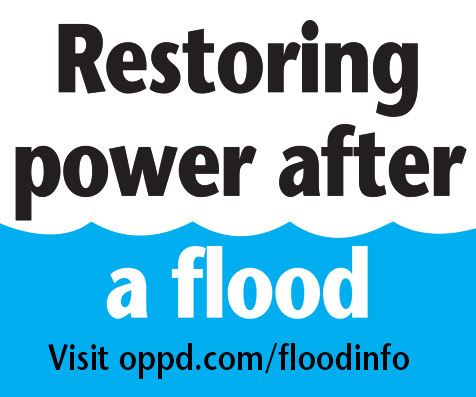 This practice is especially important during restoration efforts. “We’ve gone all the way to the Kansas border because we have lines down there,” Donham said. 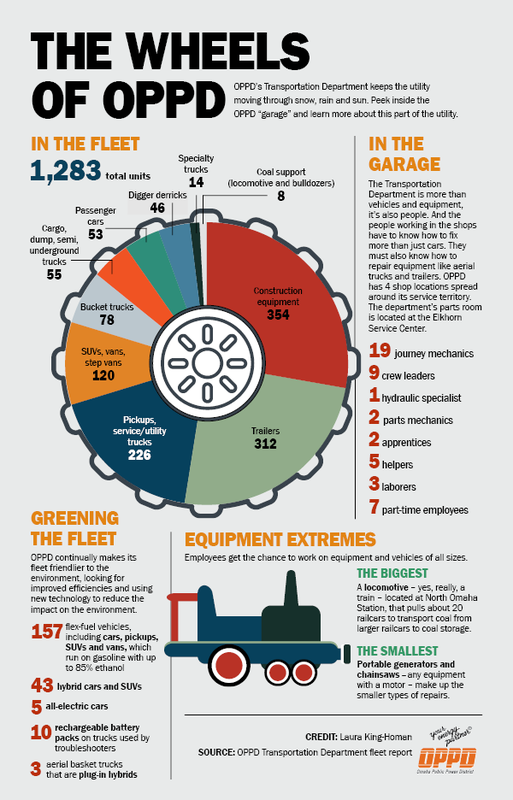 This infographic details the pieces of OPPD’s fleet. 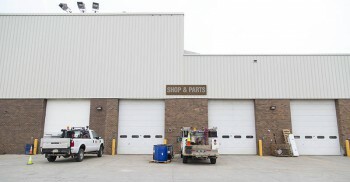 An OPPD truck sits in a bay at the Elkhorn garage. Mechanic Kurt Hartman uses a laptop to perform maintenance checks on an OPPD bucket truck. 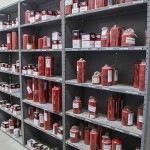 Equipment and parts line the shelves of the Elkhorn garage. 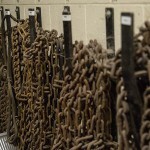 Utility vehicles need plenty of chains to keep moving in bad weather. Laborer Seth Hanson inspects a part at OPPD’s Elkhorn Service Center garage. 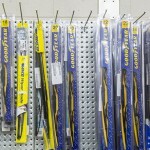 Hundreds of vehicles require plenty of wiper blades to be on hand. 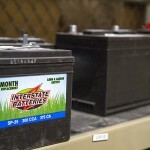 Batteries are a constant check point during cold weather. Hanson makes a repair in the Elkhorn garage. MUD has a fleet of natural gas vehicles. Would it not make good business sense for OPPD to have some electric vehicles and charging stations at all of your business offices and power plants, as well as incentives for employees and the public to invest in electric powered transportation? Electric powered vehicles are a long way from being ready for mass use. Wait until one or two of the car manufacturers have proven the dependability of their product over several years. The infrastructure of electric charging stations is a huge expense that also can wait until the vehicles are proven dependable.